ആൽഫ്രഡ് നോബലിന്റെ സ്മരണാർത്ഥം ധനതത്ത്വശാസ്ത്രരംഗത്തെ മികച്ച സേവനങ്ങൾക്ക് നല്കുന്ന പുരസ്കാരമാണ് "ആൽഫ്രഡ് നോബലിന്റെ സ്മരണാർത്ഥം സാമ്പത്തികശാസ്ത്രത്തിനുള്ള സ്വെറിഗ്സ് റിക്സ്ബാങ്ക് സമ്മാനം" എന്ന ഔദ്യോഗികനാമത്തിലറിയപ്പെടുന്ന, സാമ്പത്തികശാസ്ത്രത്തിനുള്ള നോബൽസമ്മാനം. (ഇംഗ്ലീഷ്:The Sveriges Riksbank Prize in Economic Sciences in Memory of Alfred Nobel, സ്വീഡിഷ്: Sveriges riksbanks pris i ekonomisk vetenskap till Alfred Nobels minne) 1969 മുതൽ വർഷംതോറും റോയൽ സ്വീഡിഷ് അക്കാദമി ധനതത്ത്വശാസ്ത്രരംഗത്തെ ഗവേഷകർക്ക് ഈ പുരസ്കാരം നല്കിവരുന്നു. 1969ൽ ആദ്യത്തെ ധനതത്ത്വശാസ്ത്ര നോബൽസമ്മാനത്തിന് അർഹരായത് റെയ്ഗ്നർ ഫ്രിഷ്, ജാൻ ടിൻബെർഗൻ എന്നിവരാണ്. പുരസ്കാരം നേടുന്ന ഓരോരുത്തർക്കും മെഡലും ബഹുമതിപത്രവും പണവും സമ്മാനമായി നല്കുന്നു. വാസ്തവത്തിൽ ആൽ‌ഫ്രഡ് നോബൽ ഏർപ്പെടുത്തിയ അഞ്ചു നോബൽ സമ്മാനങ്ങളിൽ ഉൾപ്പെട്ടതായിരുന്നില്ല സാമ്പത്തികശാസ്ത്രത്തിനുള്ള നോബൽസമ്മാനം. ഇങ്ങനെയൊരു സമ്മാനത്തെക്കുറിച്ച് അദ്ദേഹം തന്റെ വിൽപത്രത്തിൽ പറഞ്ഞിട്ടില്ലായിരുന്നു. 1968-ൽ സ്വീഡിഷ്‌ ബാങ്കായ സ്വെറിഗ്‌സ്‌ റിക്സ്ബാങ്ക്‌, അവരുടെ 300ാം വാർഷികത്തിൽ നോബലിനോടുള്ള ആദരസൂചകമായി നോബലിന്റെ പേരിൽ സാമ്പത്തികശാസ്‌ത്രത്തിനുള്ള നോബൽ സമ്മാനം കൂടി ചേർത്തു. സാമ്പത്തികശാസ്‌ത്രത്തിലെ നോബൽ സമ്മാനജേതാവിനെ തെരഞ്ഞെടുക്കാനുള്ള ഉത്തരവാദിത്തം കൂടി റോയൽ സ്വീഡിഷ്‌ അക്കാദമി ഓഫ്‌ സയൻസിൽ നിക്ഷിപ്‌തമാണ്‌. നോബലിന്റെ മരണവാർഷികദിനമായ ഡിസംബർ 10-ന് സ്റ്റോക്ക്‌ഹോമിൽ വച്ചാണ് ഈ അവാർഡ് നൽകുന്നത്. സാമ്പത്തികശാസ്ത്രത്തിനുള്ള നോബൽ സമ്മാനം നേടിയവരുടെ പട്ടിക. 1969 റാഗ്‌നർ ഫ്രിസ്ച് Norway "for having developed and applied dynamic models for the analysis of economic processes"
1970 പോൾ സാമുവൽസൺ United States "for the scientific work through which he has developed static and dynamic economic theory and actively contributed to raising the level of analysis in economic science"
1971 സൈമൺ കുസ്നെറ്റ്സ് United States "for his empirically founded interpretation of economic growth which has led to new and deepened insight into the economic and social structure and process of development"
1972 ജോൺ ഹിക്സ് United Kingdom "for their pioneering contributions to general economic equilibrium theory and welfare theory." 1974 ഗുണ്ണർ മിർദാൽ Sweden "for their pioneering work in the theory of money and economic fluctuations and for their penetrating analysis of the interdependence of economic, social and institutional phenomena." 1975 Leonid Kantorovich Soviet Union "for their contributions to the theory of optimum allocation of resources"
1976 Milton Friedman United States "for his achievements in the fields of consumption analysis, monetary history and theory and for his demonstration of the complexity of stabilisation policy"
1977 Bertil Ohlin Sweden "for their pathbreaking contribution to the theory of international trade and international capital movements"
1978 Herbert A. Simon United States "for his pioneering research into the decision-making process within economic organizations"
1979 Theodore Schultz United States "for their pioneering research into economic development research with particular consideration of the problems of developing countries." 1980 Lawrence Klein United States "for the creation of econometric models and the application to the analysis of economic fluctuations and economic policies"
1981 James Tobin United States "for his analysis of financial markets and their relations to expenditure decisions, employment, production and prices"
1982 George Stigler United States "for his seminal studies of industrial structures, functioning of markets and causes and effects of public regulation"
1983 Gérard Debreu France "for having incorporated new analytical methods into economic theory and for his rigorous reformulation of the theory of general equilibrium"
1984 Richard Stone United Kingdom "for having made fundamental contributions to the development of systems of national accounts and hence greatly improved the basis for empirical economic analysis"
1985 Franco Modigliani Italy "for his pioneering analyses of saving and of financial markets"
1986 James M. Buchanan United States "for his development of the contractual and constitutional bases for the theory of economic and political decision-making"
1987 Robert Solow United States "for his contributions to the theory of economic growth"
1988 Maurice Allais France "for his pioneering contributions to the theory of markets and efficient utilization of resources"
1989 Trygve Haavelmo Norway "for his clarification of the probability theory foundations of econometrics and his analyses of simultaneous economic structures"
1990 Harry Markowitz United States "for their pioneering work in the theory of financial economics"
1991 Ronald Coase United Kingdom "for his discovery and clarification of the significance of transaction costs and property rights for the institutional structure and functioning of the economy"
1992 Gary Becker United States "for having extended the domain of microeconomic analysis to a wide range of human behaviour and interaction, including non-market behaviour"
1993 Robert Fogel United States "for having renewed research in economic history by applying economic theory and quantitative methods in order to explain economic and institutional change"
1994 John Harsanyi United States "for their pioneering analysis of equilibria in the theory of non-cooperative games." 1995 Robert Lucas, Jr. United States "for having developed and applied the hypothesis of rational expectations, and thereby having transformed macroeconomic analysis and deepened our understanding of economic policy"
1996 James Mirrlees United Kingdom "for their fundamental contributions to the economic theory of incentives under asymmetric information"
1997 Robert C. Merton United States "for a new method to determine the value of derivatives." 1998 Amartya Sen India "for his contributions to welfare economics"
1999 Robert Mundell Canada "for his analysis of monetary and fiscal policy under different exchange rate regimes and his analysis of optimum currency areas"
2000 James Heckman United States "for his development of theory and methods for analyzing selective samples"
Daniel McFadden United States "for his development of theory and methods for analyzing discrete choice"
2001 George Akerlof United States "for their analyses of markets with asymmetric information"
Vernon L. Smith United States "for having established laboratory experiments as a tool in empirical economic analysis, especially in the study of alternative market mechanisms"
2003 Robert F. Engle United States "for methods of analyzing economic time series with time-varying volatility (ARCH)"
Clive Granger United Kingdom "for methods of analyzing economic time series with common trends (cointegration)"
2004 Finn E. Kydland Norway "for their contributions to dynamic macroeconomics: the time consistency of economic policy and the driving forces behind business cycles." Israel "for having enhanced our understanding of conflict and cooperation through game-theory analysis." 2006 Edmund S. Phelps United States "for his analysis of intertemporal tradeoffs in macroeconomic policy"
United States "for having laid the foundations of mechanism design theory"
2008 Paul Krugman United States "for his analysis of trade patterns and location of economic activity"
2009 Elinor Ostrom United States "for her analysis of economic governance, especially the commons"
↑ "ആൽഫ്രഡ് നോബലിന്റെ സ്മരണാർത്ഥം സാമ്പത്തികശാസ്ത്രത്തിനുള്ള സ്വെറിഗ്സ് റിക്സ്ബാങ്ക് സമ്മാനം 1969-2007". ↑ "നോബൽ പ്രൈസ് ഔദ്യോഗിക വെബ്ബ്‌സൈറ്റ്". ↑ "The Sveriges Riksbank Prize in Economic Sciences in Memory of Alfred Nobel 1970". Nobel Foundation. ശേഖരിച്ചത്: 2008-10-14. ↑ "The Sveriges Riksbank Prize in Economic Sciences in Memory of Alfred Nobel 1971". Nobel Foundation. ശേഖരിച്ചത്: 2008-10-14. ↑ "The Sveriges Riksbank Prize in Economic Sciences in Memory of Alfred Nobel 1972". Nobel Foundation. ശേഖരിച്ചത്: 2008-10-14. ↑ "The Sveriges Riksbank Prize in Economic Sciences in Memory of Alfred Nobel 1973". Nobel Foundation. ശേഖരിച്ചത്: 2008-10-14. ↑ "The Sveriges Riksbank Prize in Economic Sciences in Memory of Alfred Nobel 1974". Nobel Foundation. ശേഖരിച്ചത്: 2008-10-14. ↑ "The Sveriges Riksbank Prize in Economic Sciences in Memory of Alfred Nobel 1975". Nobel Foundation. ശേഖരിച്ചത്: 2008-10-14. ↑ "The Sveriges Riksbank Prize in Economic Sciences in Memory of Alfred Nobel 1976". Nobel Foundation. ശേഖരിച്ചത്: 2008-10-14. ↑ "The Sveriges Riksbank Prize in Economic Sciences in Memory of Alfred Nobel 1977". Nobel Foundation. ശേഖരിച്ചത്: 2008-10-14. ↑ "The Sveriges Riksbank Prize in Economic Sciences in Memory of Alfred Nobel 1978". Nobel Foundation. ശേഖരിച്ചത്: 2008-10-14. ↑ "The Sveriges Riksbank Prize in Economic Sciences in Memory of Alfred Nobel 1979". Nobel Foundation. ശേഖരിച്ചത്: 2008-10-14. ↑ "The Sveriges Riksbank Prize in Economic Sciences in Memory of Alfred Nobel 1980". Nobel Foundation. ശേഖരിച്ചത്: 2008-10-14. ↑ "The Sveriges Riksbank Prize in Economic Sciences in Memory of Alfred Nobel 1981". Nobel Foundation. ശേഖരിച്ചത്: 2008-10-14. ↑ "The Sveriges Riksbank Prize in Economic Sciences in Memory of Alfred Nobel 1982". Nobel Foundation. ശേഖരിച്ചത്: 2008-10-14. ↑ "The Sveriges Riksbank Prize in Economic Sciences in Memory of Alfred Nobel 1983". Nobel Foundation. ശേഖരിച്ചത്: 2008-10-14. ↑ "The Sveriges Riksbank Prize in Economic Sciences in Memory of Alfred Nobel 1984". Nobel Foundation. ശേഖരിച്ചത്: 2008-10-14. ↑ "The Sveriges Riksbank Prize in Economic Sciences in Memory of Alfred Nobel 1985". Nobel Foundation. ശേഖരിച്ചത്: 2008-10-14. ↑ "The Sveriges Riksbank Prize in Economic Sciences in Memory of Alfred Nobel 1986". Nobel Foundation. ശേഖരിച്ചത്: 2008-10-14. ↑ "The Sveriges Riksbank Prize in Economic Sciences in Memory of Alfred Nobel 1987". Nobel Foundation. ശേഖരിച്ചത്: 2008-10-14. ↑ "The Sveriges Riksbank Prize in Economic Sciences in Memory of Alfred Nobel 1988". Nobel Foundation. ശേഖരിച്ചത്: 2008-10-14. ↑ "The Sveriges Riksbank Prize in Economic Sciences in Memory of Alfred Nobel 1989". Nobel Foundation. ശേഖരിച്ചത്: 2008-10-14. ↑ "The Sveriges Riksbank Prize in Economic Sciences in Memory of Alfred Nobel 1990". Nobel Foundation. ശേഖരിച്ചത്: 2008-10-14. ↑ "The Sveriges Riksbank Prize in Economic Sciences in Memory of Alfred Nobel 1991". Nobel Foundation. ശേഖരിച്ചത്: 2008-10-14. ↑ "The Sveriges Riksbank Prize in Economic Sciences in Memory of Alfred Nobel 1992". Nobel Foundation. ശേഖരിച്ചത്: 2008-10-14. ↑ "The Sveriges Riksbank Prize in Economic Sciences in Memory of Alfred Nobel 1993". Nobel Foundation. ശേഖരിച്ചത്: 2008-10-14. ↑ "The Sveriges Riksbank Prize in Economic Sciences in Memory of Alfred Nobel 1994". Nobel Foundation. ശേഖരിച്ചത്: 2008-10-14. ↑ "The Sveriges Riksbank Prize in Economic Sciences in Memory of Alfred Nobel 1995". Nobel Foundation. ശേഖരിച്ചത്: 2008-10-14. ↑ "The Sveriges Riksbank Prize in Economic Sciences in Memory of Alfred Nobel 1996". Nobel Foundation. ശേഖരിച്ചത്: 2008-10-14. ↑ "The Sveriges Riksbank Prize in Economic Sciences in Memory of Alfred Nobel 1997". Nobel Foundation. ശേഖരിച്ചത്: 2008-10-14. ↑ "The Sveriges Riksbank Prize in Economic Sciences in Memory of Alfred Nobel 1998". Nobel Foundation. ശേഖരിച്ചത്: 2008-10-14. ↑ "The Sveriges Riksbank Prize in Economic Sciences in Memory of Alfred Nobel 1999". Nobel Foundation. ശേഖരിച്ചത്: 2008-10-14. ↑ 34.0 34.1 "The Sveriges Riksbank Prize in Economic Sciences in Memory of Alfred Nobel 2000". Nobel Foundation. ശേഖരിച്ചത്: 2008-10-14. ↑ "The Sveriges Riksbank Prize in Economic Sciences in Memory of Alfred Nobel 2001". Nobel Foundation. ശേഖരിച്ചത്: 2008-10-14. ↑ 36.0 36.1 "The Sveriges Riksbank Prize in Economic Sciences in Memory of Alfred Nobel 2002". Nobel Foundation. ശേഖരിച്ചത്: 2008-10-14. ↑ 37.0 37.1 "The Sveriges Riksbank Prize in Economic Sciences in Memory of Alfred Nobel 2003". Nobel Foundation. ശേഖരിച്ചത്: 2008-10-14. ↑ "The Sveriges Riksbank Prize in Economic Sciences in Memory of Alfred Nobel 2004". Nobel Foundation. ശേഖരിച്ചത്: 2008-10-14. ↑ "The Sveriges Riksbank Prize in Economic Sciences in Memory of Alfred Nobel 2005". Nobel Foundation. ശേഖരിച്ചത്: 2008-10-14. ↑ "The Sveriges Riksbank Prize in Economic Sciences in Memory of Alfred Nobel 2006". Nobel Foundation. ശേഖരിച്ചത്: 2008-10-14. ↑ "The Sveriges Riksbank Prize in Economic Sciences in Memory of Alfred Nobel 2007". Nobel Foundation. ശേഖരിച്ചത്: 2008-10-14. ↑ "The Sveriges Riksbank Prize in Economic Sciences in Memory of Alfred Nobel 2008". Nobel Foundation. ശേഖരിച്ചത്: 2008-10-14. ↑ 43.0 43.1 "The Sveriges Riksbank Prize in Economic Sciences in Memory of Alfred Nobel 2009". Nobel Foundation. ശേഖരിച്ചത്: 2009-10-12. ↑ "The Prize in Economic Sciences 2010". Nobel Foundation. ശേഖരിച്ചത്: 2010-10-11. ↑ "The Prize in Economic Sciences 2011". Nobel Foundation. ശേഖരിച്ചത്: 2011-10-10. 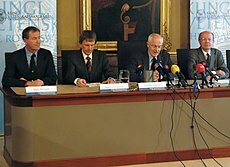 ↑ "The Sveriges Riksbank Prize in Economic Sciences in Memory of Alfred Nobel 2012". Nobel Foundation. ശേഖരിച്ചത്: 2016-07-01. ↑ "The Sveriges Riksbank Prize in Economic Sciences in Memory of Alfred Nobel 2013". Nobel Foundation. ശേഖരിച്ചത്: 2016-07-01. ↑ "The Sveriges Riksbank Prize in Economic Sciences in Memory of Alfred Nobel 2014". Nobel Foundation. ശേഖരിച്ചത്: 2014-10-13. ↑ "The Sveriges Riksbank Prize in Economic Sciences in Memory of Alfred Nobel 2015". Nobel Foundation. ശേഖരിച്ചത്: 2015-10-12. ഈ താൾ അവസാനം തിരുത്തപ്പെട്ടത്: 20:26, 20 ഒക്ടോബർ 2016.